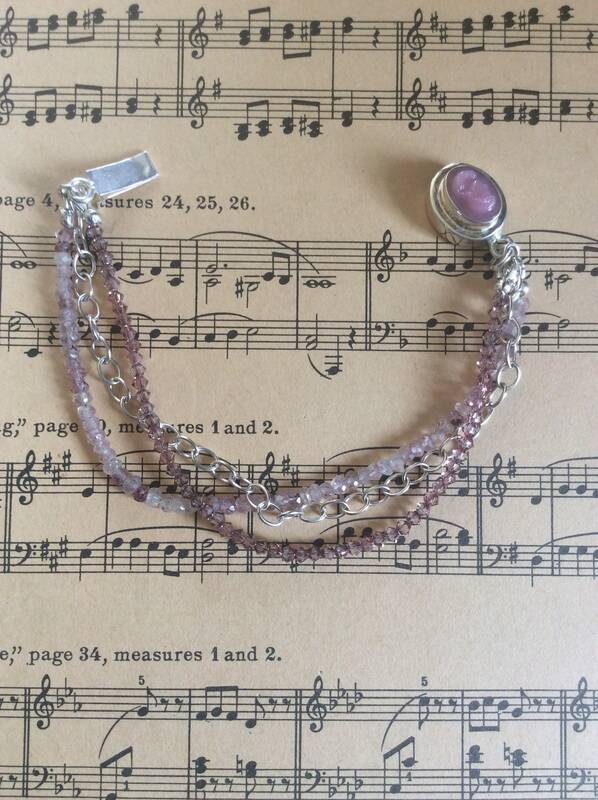 Hues of pink and rose comprise this ultra feminine sterling silver bracelet! Most definitely a one of a kind (OOAK) piece of hand crafted jewelry. I do not make exact duplicates of any of my designs. I owe it to you to make a special bracelet that No One but you owns! As it is with all of my items, I don’t have a “master blueprint” of what I’m creating. Certain combinations of tones and colors interest me, and from there the project begins. I see how the chosen elements lay and see what other strands will finish it in a pleasing way. 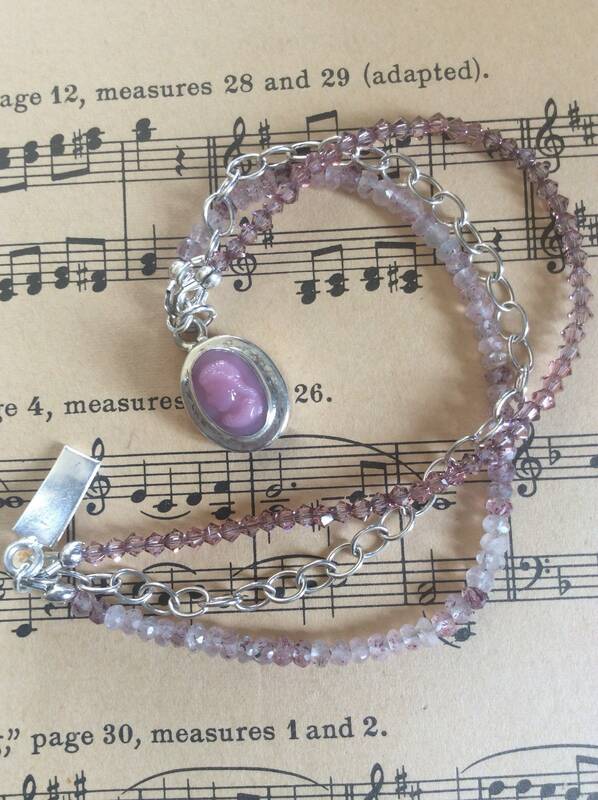 This includes the additions of chains and dangles to add the element of movement to each piece. I don’t believe I’m overly-gifted designer in any way; it just comes from years of patience and practice! 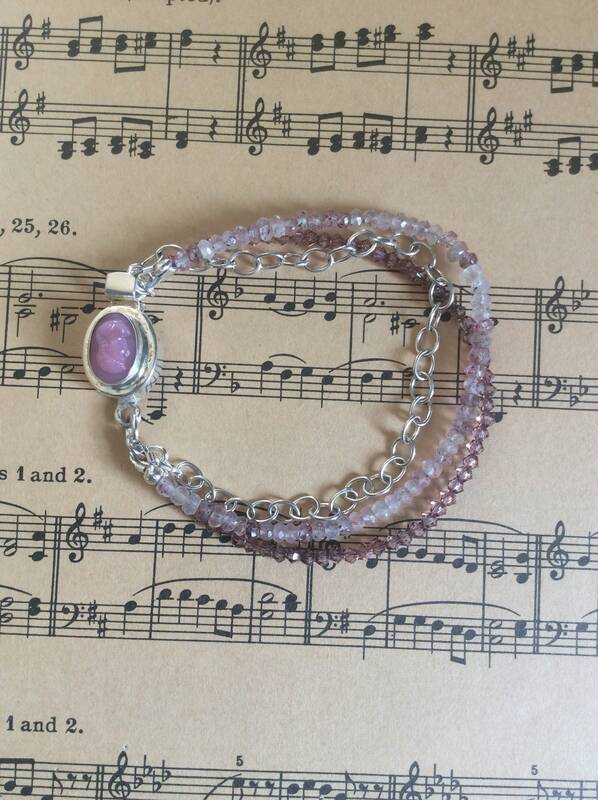 As seen in the last photograph, the bracelet fits a size 7” wrist. If you’ll take a piece of string, wrap it snuggly around your wrist below the bone that sticks up, add 1/2” to that measurement then send it to me. 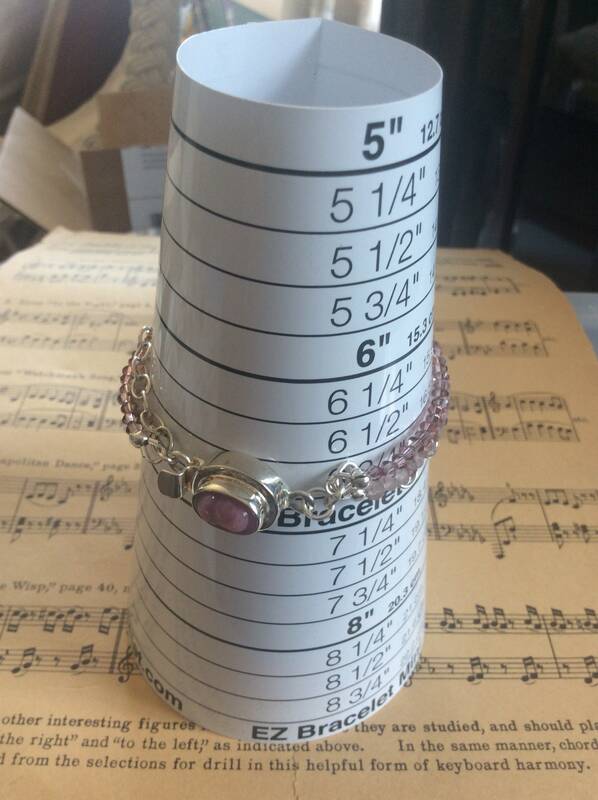 I’m able to add a few millimeters of length to the bracelet, but not a huge amount! Please ask me any questions or concerns in the “conversation” section of my page! I can guarantee when you wear your bracelet, people will notice! This is a high end piece of jewelry that’s not like the popular Silpada line or other mass produced, easily recognizable companies. You’ll be showing folks that you prefer something different- an article made using high-end materials...and is Artisan created! Your bracelet will arrive in a glossy black lidded box with an elastic gold ribbon and bow. If this is a gift going to a different address than your own, let me know in the “convo” section, and I’ll ship it to that address along with a personalize, hand written note with your sentiments conveyed! Shipping is free, and repairs are free too, provided you pay for shipping. Please treat your pieces carefully! Store your bracelet in the provided plastic bag with a strip of anti tarnish paper. Don’t wear it swimming, while participating in extreme sports, or gardening... Leave it at home if you’ve been selected for the next space flight, or attending a wickening. You get the idea... just be sensible about it. If you want a piece you never take off, check out my base metal (brass, bronze, or copper) pieces which are hardier and stronger!